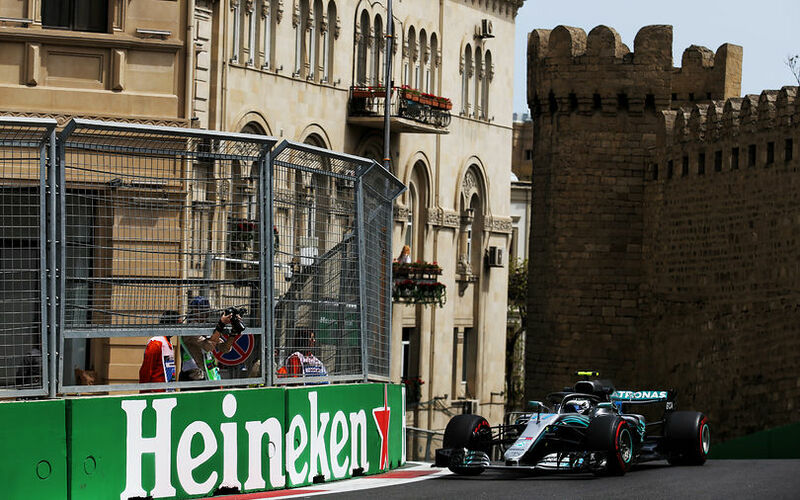 Valtteri Bottas topped the first session at Baku and flushed away fears that Mercedes were slowly dropping down the pecking order. The Finn didn't have much of a margin over Daniel Ricciardo though, with the Australian coming very close to the fastest lap time as well. Ricciardo's lap was an interesting message to Bottas, as he managed to do his lap on super soft tyres, contrary to Bottas being on the softer ultra soft compound. While you'd expect Mercedes and Red Bull at the front, Force India were surprisingly firmly among the top 6, with Perez going third fastest, and Ocon 5th, sandwishing Lewis Hamilton on the timing sheet. The pink cars have been searching for performance in earlier races, despite numerous car updates, but it appears like their initial set-up at Baku seems spot on. Max Verstappen was 6th fastest, with his best recorded on soft tyres before he crashed out. The Dutchman lost the rear under braking and slid sideways into the TecPro barrier at Turn 5. This incident forced him to step out of the car and sit out the remainder of the session. Fernando Alonso occupied his fairly familiar 7th spot on the sheet, followed by Sirotkin in the Williams and Pierre Gasly in the fastest Toro Rosso. Sebastian Vettel was the fastest Ferrari while Raikkonen was even down in 15th. The Scuderia suffered a troubling session with the German complaining of a lack of rear grip. His Finnish team mate meanwhile completed just 10 laps before being confined to the garage with a technical issue on his SF71-H.